Z is now moved to our new home in Missouri! Yeah! The next day after the trip, I noticed that Z had body swelling on her ribs and behind her shoulder, on the left side only. This edema could have been due to the trailer ride if she got bumped (that was the side of the swinging interior door on the slanted trailer), or it could be due to rolling in something (i.e.biting ants which happened to Dear One long ago) or rubbing in something that caused an allergic reaction such as the cedar logs (horses are allergic to cedar and Walnut) that make up the round pen corral that we will be removing. I put her on two days of a.m. and p.m. bute and it cleared up. The second day she showed me she was clearly okay by taking off and running the small pasture, bucking and rearing. Pandora stood under the big shade tree and watched. For the next two days I monitored them to make sure Z and Pandora would get along. In the past they were in separate areas that adjoined andwere rarely put together due to Pandora needing restricted grass. Z is the aggressive one in charge, but Pandora knows how to dance out of the way. Z is clearly jealous and protective of her time with the Humans – and has followed us about and chased off pony any time she came about. By the third day, I caught them grooming (no camera darn!). By the fourth day they were nice enough to stand quietly beside each other for treats. Because the pasture is so poor it might be possible to keep them together during our stay and forgo getting companions (a pony companion for pony and a trail riding horse). The new place has a thin layer of sandy soil over a layer of rock. Grass has shallow roots and two weeks of unusual heat has baked what remained. Supplemental hay will be needed soon. I’m teaching them to free graze in the front area of the lawn on a long lead rope and to come when called. My original plan was to fence this area in but for several reasons I’ve decided not to do so. 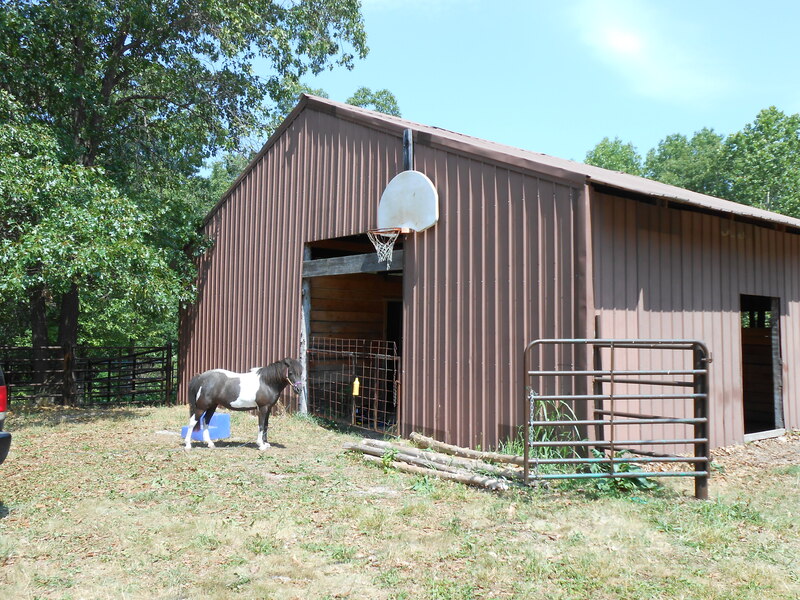 The basketball hoop will be removed and an outdoor farm light installed. There was a roundpen corral built of cedar logs that was falling apart. We are removing it completely. This will remove a dangerous eyesore (stinging ants, splinters, nails hanging out willy nilly, and rotting cross rails) and free up more area for the horses in the pasture. As it was, Pandora already got a nice long splinter in her shoulder from rubbing on this piece of crap. These “hedge posts” made as a rough cut from local Cedar trees are all the rage here… give me nice lumbered cut, log designed as a fencepost that is pressure treated any day. 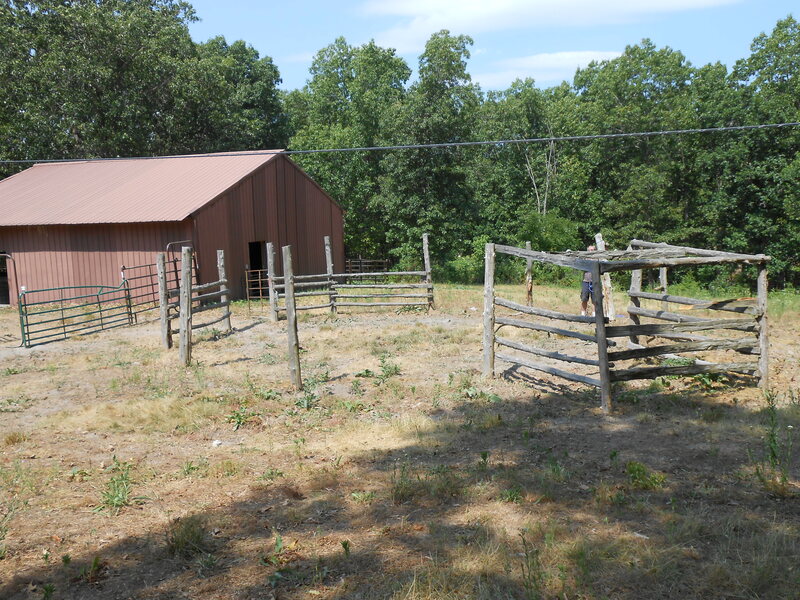 Using the landowners’ existing corral panels we made an enclosure off the one stall that is open to the pasture. I’ll buy three more panels, mark them as mine and make it more uniform (removing the three oddball panels). Capped t-posts are used as anchors. I like having an “airlock” between the main pasture and the final exit.This allows me to catch up one horse while the other is in the larger field and makes that procedure safer. It also allows me to pen-up horses in bad weather or to keep one up due to illness etc… I put a water tank into each area. The next project is converting the stall which opens into the drylot paddock, now a 10×10, to a 10×15. A remaining 5×10 will store a riding mower and garden tools. This area is right across from the tack room which has been the primary project right now. The tack room has an issue with wasps which I’ll be taking care of and needs a fan as there is no ventilation whatsoever. I will be building a counter for supplements and mixing, which the feed cans can roll under. I’m still undecided if I’ll attach saddle racks to the wall or go with a free-standing one. As you can see horse and holiday stuff has been moved. After the stall situation is settled we are going to enlarge the pasture at the back of the property. This would probably double the size but it is rough land, with stone, trees and brush. 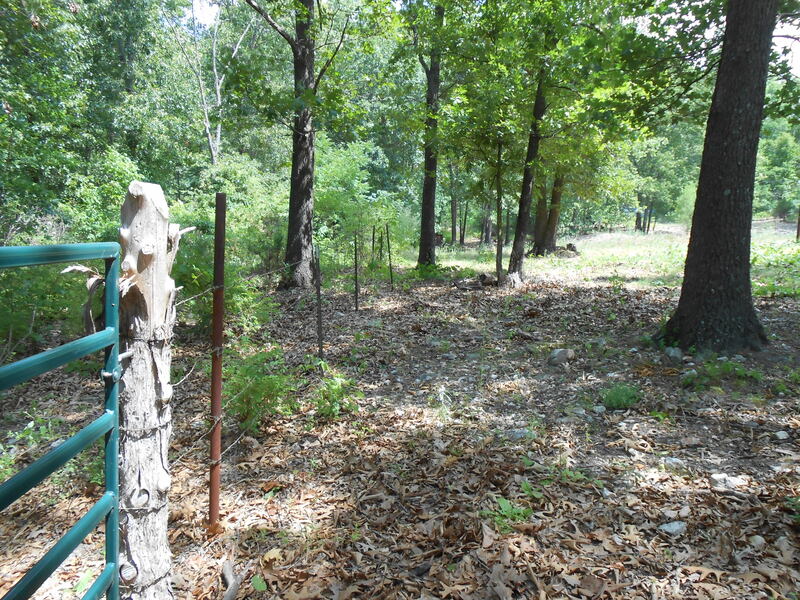 The back area of the property has 60 acres of private woods and is quiet. After staying at The Hermitage (my current name for the place) over the three day holiday it’s obvious that the traffic into the horseback riding trailhead across the street is heavy on holidays. I must have counted over 30 gooseneck trailers heading into the National Forest park over two days -no joke! The front half of the property, along the road, feels very public. Many people see your activities, and during the course of my weekend, people sat in their trucks watching us – or two were on horses, watching and chatting. I’m sure the majority of this activity was perfectly innocent- for instance, some people were waiting to flag down late arrivals. However, never underestimate the cadginess of the thief or the malaciousness of the weekend partier fueled by beer and little common sense. By reading and keeping an eye on the local Craigslist, there someone operating in the area that is stealing horses. 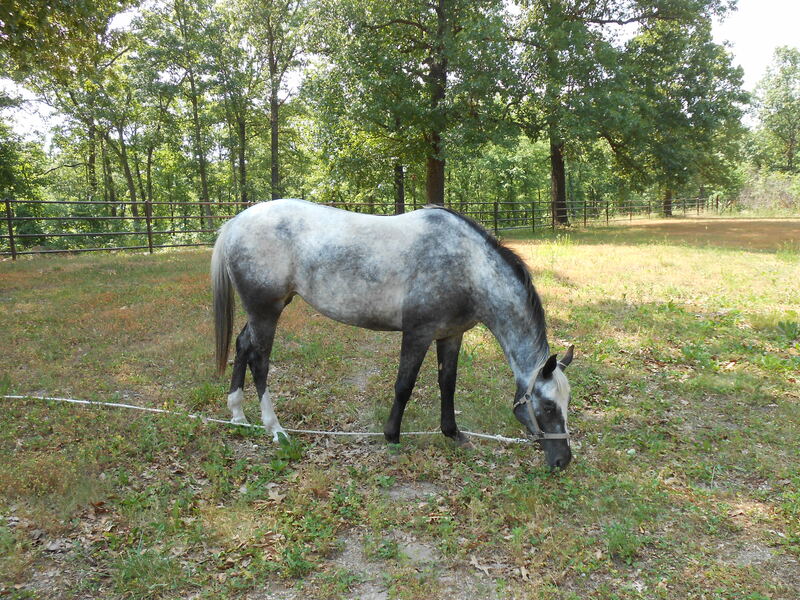 For instance, a branded Warmblood was stolen out of a pasture of horses – he was the only one taken. I have seen other posts in re: to stolen animals, and the first line of defense is to remove temptation. Once you go past the corner of the barn, it becomes quieter and more private. At night I would rather the horses be penned up or at the back half of the property. If I go with a pony companion for Pandora, I will put them at the front in 1/3rd, and keep Z and a horse companion at the back 2/3rds. Call me paranoid but I do not want the horses, especially Z who is an eyecatcher, to be consistently at the road over the weekend. This entry was posted in Pandora, Z. Bookmark the permalink.